Diplomacy that reaches beyond government-to-government contacts in order to seek influence over a foreign public has long been a facet of international relations, well before Edmund Gullion at Tufts University’s Fletcher School of Diplomacy coined the term “public diplomacy” in 1965. But it was Harvard University professor Joseph Nye, in his 2004 book, Soft Power: The Means to Success in World Politics, who laid the intellectual foundations of an approach to diplomacy that goes beyond the hard power afforded by a strong economy and military to wield influence. Ironically, in the same year that Nye published his seminal work, Mark Zuckerberg and some fellow classmates at Harvard founded Facebook; two years later, Jack Dorsey created Twitter. Today, the concepts of soft power and public diplomacy are inexorably intertwined with the power of social networks — Facebook’s 950 million users or Twitter’s 500 million — as well as other technology-driven means of communication such as YouTube. 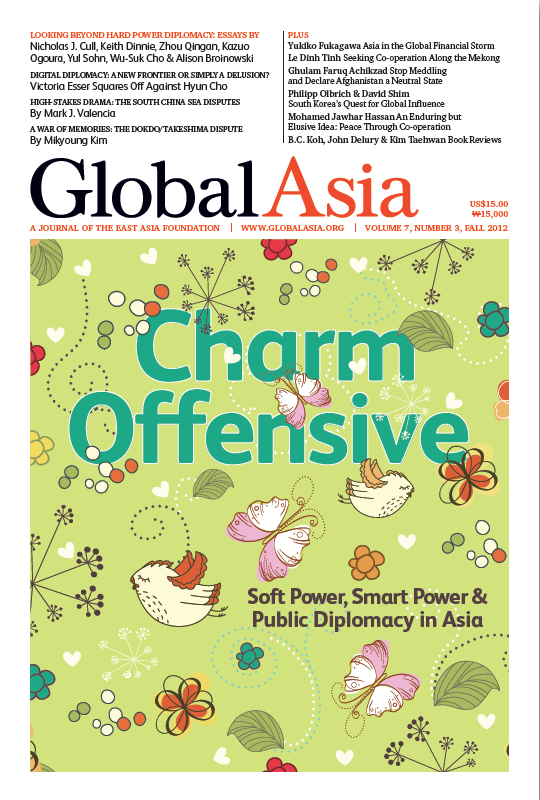 In this cover package of Global Asia, we explore how a number of Asian countries exercise soft power and public diplomacy in the battle for hearts and minds. But as always, hard power is never far from the surface. In our section of feature essays, Mark J. Valencia lays out the latest drama of the South China Sea disputes, where the potential for force is real and where China and the US appear engaged in a classic great-power rivalry in the very living room of ASEAN. Mikyoung Kim, in an essay on the rituals of mutual misunderstanding between Japan and Korea in their dispute over the Dokdo/Takeshima islets, reminds us that maritime disputes aren’t confined to Southeast Asia. Yukiko Fukagawa examines the resilience of Asia in the midst of the ongoing global economic storm, and examines how greater integration would further strengthen the region. The need for greater trans-border co-operation in the Mekong River Basin is the subject of Le Dinh Tinh’s essay, and he warns that the peace and stability of the region are at stake. Ghulam Faruq Achikzad, meanwhile, laments the foreign interventions and occupations that have plagued Afghanistan, and calls on the international community to declare it a neutral state and let Afghans map out a future without foreign interference. Rounding out our feature essays, Philipp Olbrich and David Shim chronicle South Korea’s efforts to assume a greater leadership role in the world. Our occasional section on trends and new ideas takes an ironic twist, with Mohamed Jawhar Hassan showing how a proposal on enhancing security in the Asia-Pacific first published in 1995 is as relevant today as it was back then. In our main book review, B.C. Koh focuses on two books that present vastly differing views on North Korea and how South Korea and the world should deal with the North. While economic and military power continue to dominate perceptions of geopolitical influence and shape the contours of traditional diplomacy, the idea that nations must also resort to soft power and public diplomacy in order to advance their interests has taken hold in much of the world, including Asia. In the more complex task of nation branding and the conduct of public diplomacy, Asian countries still have a long way to go. Japan’s cultural and public diplomacy have gone through a complex evolution and adapted repeatedly to the country’s rapidly changing place in the world. In the conduct of public diplomacy, the notion of network power alongside soft power is crucial to South Korea’s role as a middle power. Digital Diplomacy: A New Frontier Of Diplomacy or Simply a Delusion? The US is seen as a bellweather for global trends, and digital diplomacy is no exception. The State Department and US diplomats have embraced online tools, in particular social media. Information technology has brought about significant changes in the way diplomats conduct their business. While public diplomacy is easier, there still is and will continue to be a need for personal contacts and formal state-to-state relations. The latest act in the long-running saga of the South China Sea has seen China moving aggressively to enforce its claim to most of the features of the potentially oil-rich sea while the US ‘rebalanced’ its defense and foreign policy toward Asia. The disputed islets known by Koreans as Dokdo and by Japanese as Takeshima continue to plague bilateral relations between the two countries, and each side approaches the issue from a different perspective. Asia Is Weathering the Global Economic Storm, but Can It Do Better? While Asia is doing reasonably well after the global financial crisis of 2008 thanks to actions taken in the wake of the Asian currency crisis of 1997-98, deeper regional integration is needed. Ghulam Faruq Achikzad argues that it’s time for the international community, and especially Afghanistan’s neighbors, to declare Afghanistan neutral and allow the Afghan people to shape their own future without foreign interference. Le Dinh Tinh outlines the power politics at play, and why enhanced co-operation is vital to security in the Mekong River Basin. Although the Korean War ended nearly 60 years ago, the peninsula remains under the ominous threat of another conflagration whose consequences are too horrifying to contemplate.